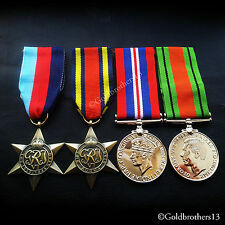 New listingWW2 four medal set with MID. Scorpion Squadron RAF. Medals to William Leslie Barnes. The obverse shows the bareheaded effigy of King George VI, facing left. (George 6th, by the grace of God, King of all the Britains, Defender of the Faith,Emperor of India). The reverse shows the Royal Crown resting on an oak sapling, flanked by a lion and a lioness above stylised waves. This set issued to A.A. Sparke of the 21st London Regt. Since the Japanese held superiority in the Pacific Ocean, the Allies were not in a position to strike back and regain a foothold in Burma until early in 1944. (One of The Best Quality Replica on The Market). The George Cross was instituted on 24 September 1940 by King George VI. To make the set complete included are this soldiers Regular Army Certificate of service. Also included is a group photo of the soldier on his NCO course in 1947. 1914 BLACK IRON CROSS ( 2ND CLASS ). ORDER OF RED EAGLE (3RD CLASS ). BUY YOURS NOW TO ADD THIS TO YOUR COLLECTION ⇧. 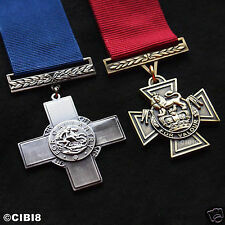 WW1 George V Cross for Gallantry. 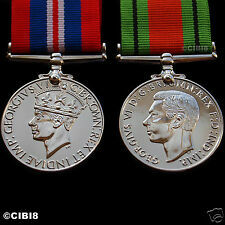 George VI WW2 1939-1945 Defence Medal & Silver D-Day Commemorative Coin Set. 11cm x 4cm. It has a slightly raised circular surround and a milled edge in the traditional style. It has a very good weight to it at 14g - fantastic quality. French Combatant's Cross 1914 1918 bronze. WW1 Armistice Coin 'Lest We Forget'. 11cm x 4cm. It has a slightly raised circular surround and a milled edge in the traditional style. It has a very good weight to it at 14g - fantastic quality. 925 silver finish. WW1 Armistice Coin 'Lest We Forget'. 24ct gold finish. It features intricate detailing throughout with fully embossed designs to both sides. My photos really do not do the item justice - any marks or imperfections are caused by background lighting, reflections etc - mint condition. High military award for Acts of Gallantry during active operations against the enemy. At the centre on the cross is the Royal Cypher. The award was originally created in 1901 as the Conspicuous Service Cross, for award to warrant and junior officers ineligible for the DSO. RARE TO FIND WITH OUT CARD BOX.